Cut the tofu into 1" cubes. Whisk together sauce ingredients. Set aside. Heat 2 tsp sesame oil over medium-high heat in a large wok or pan. When the pan is hot, add the tofu and let cook for 2 minutes on one side, undisturbed, until they develop a crisp crust. Flip and cook 2 minutes more. Remove the tofu to a plate. Return pan to the heat. Add remaining 1 tsp sesame oil to the pan along with the carrots. Saute for 3 minutes, until the carrots begin to soften. Add the bok choy and saute for 2 minutes, until it begins to soften and wilt. Return the tofu to the pan and stir in the corn starch mixture. Allow the sauce to come to a boil for it to thicken. Stir. 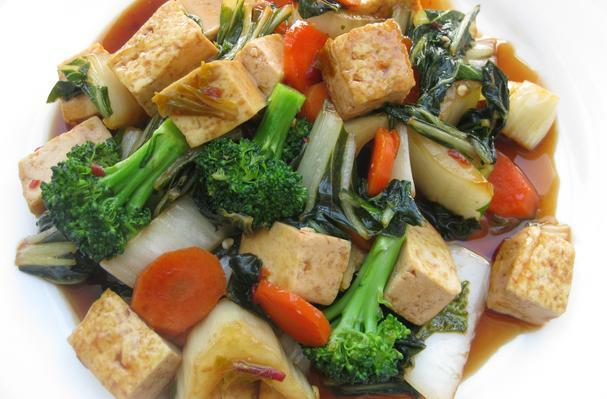 Here is the dish that changed my boyfriend's mind about tofu. Crisp-crusted with pillowy centers, this tofu is surrounded by bok choy, carrots, and a savory-sweet Thai-inspired sauce. Full of so much flavor that no one will miss the chicken, the pork, or the beef.